Released on Monday 24th June 2013. 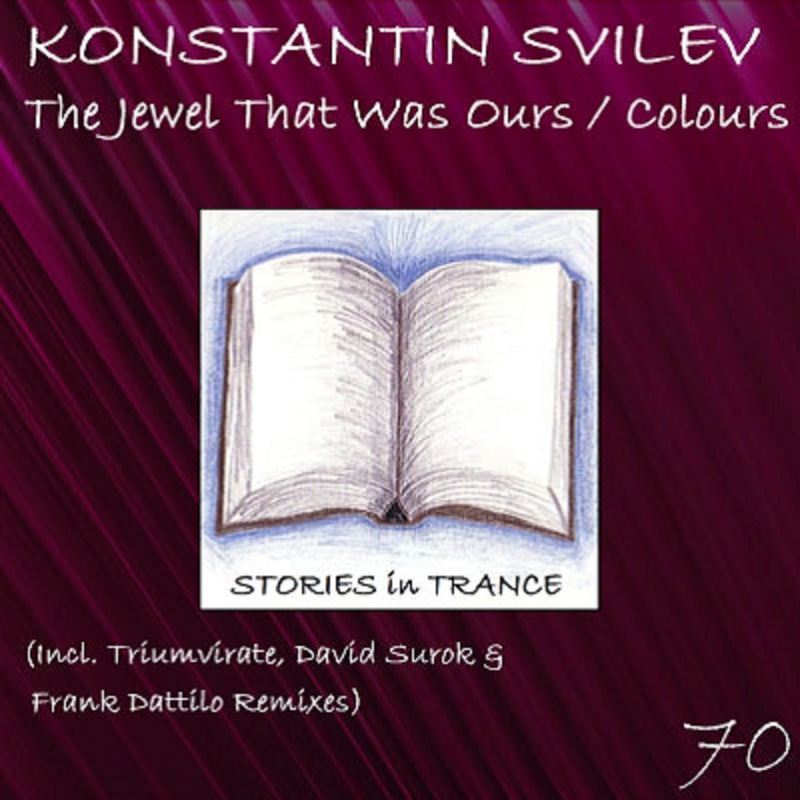 Stories In Trance are delighted to present SIT 70 by Konstantin Svilev with the five track double A-sided single The Jewel That Was Ours / Colours. Up first is the original mix of The Jewel That Was Ours. Konstantin made his debut for Stories In Trance on our Endeavour EP (SIT #51) with City and backed that up with his remixes of Four Points' Bridgestone (SIT #52), Lev Rubel's Share Your Moment (SIT #61) and Sakiva's Hammer (SIT #69) in addition to his first solo release - Exit (SIT #56). He is at his best again with this energetic and ever progressing original. A great lead is backed with fantastic atmosphere, excellent mids and subtle yet unmistakable percussion all combining beautifully into this wonderful track. Undoubtedly inspired by the Belgian trance sound of the late 90's and early 2000's, be sure to check out more of Konstantin's work with us in 2013. Secondly we have the Triumvirate Recut. After the production debut with the rework of David Surok's Sunset (SIT #47) and first original production with the unforgettable The Persistence Of Memory (SIT #60), Triumvirate are back with this truly stunning rethink. Once again a bespoke and beautifully crafted track that illustrates all that is great about trance. Gripping from second one until the very end with an abundance of pace, power, energy, emotion and soul, this can stand up there with the best. A perfect addition to any set or mix and without a doubt a real stand out piece of work. Next up we have David Surok's remix. David is building an impressive catalogue of tracks and remixes with us after his debut in the autumn of 2012. His excellent fourth original Avalon (SIT #62) was his most recent outing with us and he is back on remixing duties again in fine style. Expertly using parts of the original with his now trademark percussion and layering, combined with the always evident purpose and energy this is yet another indication of why we hold David in the regard we do at Stories In Trance. Another fine piece of work from a really exciting young producer. Konstantin's second original on this double A-side is Colours. This track is an excellent combination of subtlety and energy. Potent atmospheric touches are expertly backed up with his now trademark percussive elements and the powerful and techy lead. When a producer of real talent can infuse all these elements as well as Konstantin demonstrates in Colours it surely adds up to yet another winning package. The final part of this quintet comes in the shape of another debut on Stories In Trance, this time from upcoming Italian producer Frank Dattilo. To date, Frank has made appearances on Addicted2Bass and if he continues to show the promise he displays in this remix he will go a long way in the scene. A truly captivating take on the original, always involving and engaging, this is a production to be proud of. Look out for lots more to come from this rising newcomer.